Uglyworld #1385 - The Mosts Perfecters Name In The Worlds (Project BIG - Image 362-365), a photo by www.bazpics.com on Flickr. This mornings I heareds the sadders news that the super coolers chimpanzee that playereds Cheetah in the olders films of Tarzan had dieds at whats was probablies his huger pimpeds out mansion in Floridas. I musts add that he livereds to be a whopperings 80 years old, which is mega longs, and what a coolers life he hads too, beings the super duper films star! 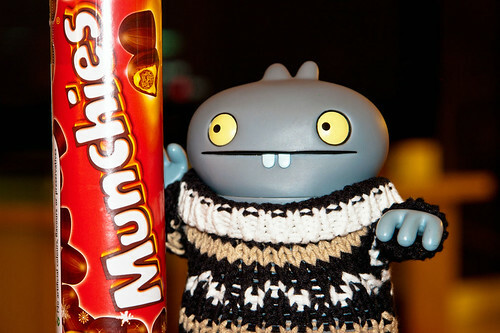 "Munchies! ", I honestlies doesn't thinks that I could have ever findereds a more perfecters name for such a tastiers chocolate, I just has to hopes that Mireille doesn't spotters me with them as I tookereds them from her personals pile of Christmaser goodies! Anyways, I will gives Highlandmonkey a hugger from alls of you outs there in internets land while we munchies some Munchies...!! !